Alex Hofeldt returns to ADHD reWired. Click here to check out his first appearance on this podcast. Alex is a high school science teacher, host of the Beautiful Dust Specks Podcast, yoga teacher, mindfulness coach, and fitness instructor. 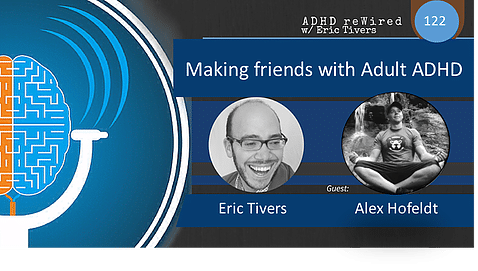 In this episode Eric and Alex discuss the social impacts of ADHD on making friends, remembering names, conversation skills, and more. For people with ADHD, life can be very difficult when in social situations. This is even more so the case in small to large groups of people. We cannot expect everyone we know and interact with to factor our “condition” into everything we say think or feel. People are generally impatient when it comes to these things and for those who are interested in fitting in, this can be a very disheartening circumstance. Forgetting names is common and people can sometimes feel they are not regarded highly enough by you for you to take the time to actually remember their name. Blurting out can be considered rude in that it is generally taken as an interruption. Sometimes people with ADHD are just different and therefore misunderstood. This can even be the case with other people with ADHD. Those of us with ADHD do tend to stand out and it can be frustrating when one day our peers depend on us for entertainment and the next day just can’t seem to deal with us. Some of us have been in a similar circumstance when we are treated as the court jester among our “friends,” as if we are there for the sole purpose of their amusement when they want us to perform. During this episode, Eric Tivers coaches Alex around the area of social relationships. Alex mentions many of the challenges as stated above and goes further with some more specific things. Eric offered Alex what I felt was some really sound advice. It was not just general tips we have all heard before. It was catered to his specific problems, which is what an ADHD coach should always do. Alex was kind enough to agree to come back on the show to discuss how his problem has changed as a result of the coaching Eric provided him. Please stay tuned to ADHD reWired for the follow-up with Alex. – Shownotes by Tom Nardone.